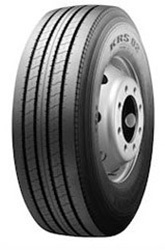 KRS02 Longmark tyres are specifically designed for trucks and heavy vehicles that place significantly different demands on tyres to other vehicles. The most obvious difference is an increase in weight, which is further increased when carrying a full load and extra support in the tyres is needed to support this. Stability, reliability and durability are all important for these tyres and Marshal have the perfect balance to keep you travelling at all times, so don’t miss KRS02 Longmark tyres.